Born on 24 October 1933, twins Reginald and Ronald Kray were short, not especially bright, vicious thugs who terrorized much of the East End of London in the 1950s and 1960s. They took a percentage of other villains’ jobs to finance their own lifestyle. On 16 July 1964 the Daily Mirror ran a story about “the picture we dare not print”. The picture showed Tory peer Robert Boothby on a settee next to his lover Ronnie. Boothby sued for libel and won £40,000. It was after this that a squad was formed by Detective Inspector Leonard “Nipper” Read to bring down the Krays. On 9 March 1966 Ronnie shot George Cornell, a member of the south London Richardson gang (search the article) in the Blind Beggar pub. 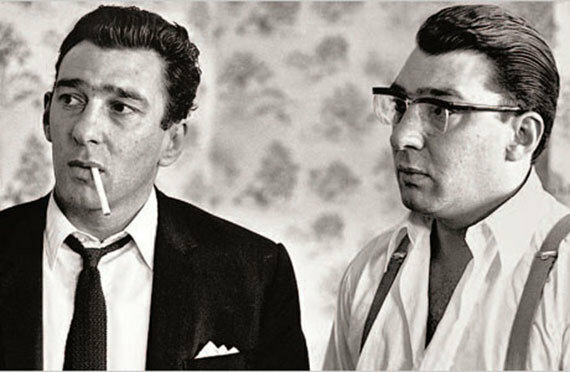 Kray and his associate, Ian Barrie, walked into the pub and Kray fired three shots but only one hit Cornell. Supposedly Ronnie had been enraged when Cornell called him “a fat pool” but in 1989 he said that it was because Cornell had threatened to kill him. Meanwhile, the twins had arranged for Mad Axeman Frankie Mitchell to escape from prison on 12 December 1966. Holed up in a safe house, he became restless and on 23 December 1966 Kray associate, Alfie Gerrard, shot him. In October 1967 Reggie killed Jack “The Hat” McVitie. After a gun failed to go off, he stabbed McVitie to death while Ronnie Hart and Tony Lambrianou held McVitie. Reggie also killed Mad Teddy Smith, a gay member of their gang who had helped with the Mitchell escape, when he became an embarrassment. Ronnie murdered an unfaithful prostitute boyfriend, and there were at least four other victims. At 6am on 7 May 1968 Nipper Read and his team arrested members of the Krays’ Firm. Both twins were in bed with blonds — Reggie with a woman and Ronnie a man. The trial Of the twins, brother Charlie and seven of their men began at the Old Bailey on 8 January 1969. On 5 March 1969 the Krays were found guilty on all charges and sentenced to life imprisonment with a recommendation from the judge, Mr Justice Melford Stevenson, that they serve at least 30 years: “In my view society has earned a rest from your activities”. Both twins, despite being gay, married while incarcerated. Ronnie died on 17 March 1995. Reggie died on 1 October 2000.